Conservation action, one step at a time. Signs of conservation action: A drainage grate in Allerton, Iowa, reads “Dump no waste! Drains to waterways.” A sign near Chariton advertises the Rathbun Land and Water Alliance. Windsor Heights, Iowa, has installed signs identifying the Walnut Creek watershed, which includes a big piece of the city. Matt Hauge is the Council’s communications and outreach director. Talking with other Iowans about what we’re doing to protect our land, water and air is one of the best parts of my job. As I am out traveling or working events for the Council, I have heard enough of your inspiring stories to be absolutely convinced Iowans can solve any environmental challenge we face. That’s why I was surprised yesterday when a woman approached our booth at the Natural Living Expo and said to me, “You won’t like me.” But why not? Iowa farmers support expanding conservation requirements for soil erosion and the control of nitrogen and phosphorous runoff, according to a new analysis of Iowa Farm and Rural Life Poll data from 2009 and 2010. According to a new article by Iowa State University sociologist J. Gordon Arbuckle, nearly 80% of farmers agree they should “do more to reduce nutrient and sediment runoff into streams and lakes.” A majority also agree farmer action on these environmental concerns should be required regardless of whether they participate in federal farm programs. Arbuckle completed the analysis, published in the current issue of the Journal of Soil and Water Conservation, to determine the degree to which farmers support Conservation Compliance, a federal policy intended to protect vulnerable soils from excessive erosion. Under that policy, first adopted by Congress in 1985, farmers who grow crops on highly erodible soils without a conservation plan in place risk losing their eligibility for a variety of federal farm programs. As Arbuckle points out, the policy has generated substantial conservation benefits by reducing federal farm subsidies for environmentally harmful practices. As Congress attempted to write a new farm bill in 2012, many conservation groups called for expanding the current role of conservation compliance by connecting it to federally-subsidized crop insurance subsidies. Congress’s failure to pass a new farm bill leaves that aspect of conservation compliance’s future in question, but according to Arbuckle, Iowa farmers support expanding the program and even applying it to farms not participating in federal farm programs. In fact, 66% of Iowa farmers said they support extending conservation compliance requirements to all highly erodible soils whether or not the farmer is participating in federal farm programs. Last November, the Iowa Department of Agriculture and Land Stewardship, together with officials from the Iowa Department of Natural Resources (DNR) and Iowa State University released a state nutrient reduction strategy they say will help resolve this problem. 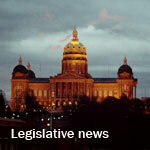 The Iowa Environmental Council and other environmental and conservation groups have criticized the plan because it continues existing all-voluntary conservation programs without additional goals or accountability for creating clean water results in Iowa. According to the new analysis, Iowa farmers may be willing to consider mandatory options for controlling nitrogen and phosphorous pollution some state leaders—including Iowa Secretary of Agriculture Bill Northey—have stated they wish to avoid. 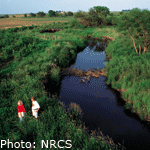 The poll results showed an overwhelming majority of Iowa farmers (92%) agreed “a good farmer is one who minimizes soil erosion,” and more than 80% also agreed the health of streams running through or along their land is their responsibility. Tired of waiting for clean water? #EnviroLobbyDay is just days away. Turns out he supports clean water, too. Members of Iowa’s conservation and environmental communities are joining together on February 26, 2013, to voice the importance of caring for this land we all love! Together, Iowans from all walks of life will urge lawmakers to provide strong state funding for programs that protect our land, water and natural resources. When: Tuesday, February 26, 2013, beginning at 8:00 a.m. This year’s event will be especially memorable because individuals and organizations that belong to the Iowa Environmental Council, Resource Enhancement and Protection (REAP) Alliance and the Iowa’s Water and Land Legacy (IWLL) Coalition are all planning to turn out in large numbers to support clean water and a healthy Iowa environment. Participants are being asked to wear blue shirts when they are at the Capitol so they can be identified with the clean water we all want. 8:00 a.m. Preview briefing at the Wallace Building Auditorium. This will include background on the movement to raise the sales tax to fund the Natural Resources and Outdoor Recreation Trust Fund and tips for how to talk your legislators about the fund. Then we’ll walk across the street to the Capitol together. 9:00 – 11:00 a.m. Talk with your elected representatives in person about why protecting Iowa’s air, water, and land really matters. Iowa Environmental Council, REAP Alliance, and Iowa’s Water and Land Legacy Coalition team members will be on hand to support you, and there will be talking points about legislative priorities available It also never hurts to bring a friend to join you as you chat with legislators. 11:00 a.m. News conference in the rotunda regarding the legislative issues and conservation funding. 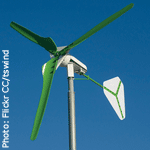 All day (9:00 a.m. to 3:00 p.m.) you can also visit booths for many Iowa conservation and environmental organizations. Commit to attend Lobby Day in person and the Iowa Environmental Council will send you updates about the event by e-mail! Visit http://envirolobbyday.eventbrite.com or click the button below to sign up. Can’t travel to Des Moines? This is the perfect time to join the Council’s Action Alert Network. On February 26, the Council will e-mail you a link to contact your legislators via e-mail. It’s a great way to participate from wherever you live. And as an Action Alert Volunteer, you’ll be ready to speak out to decision-makers on a variety of environmental issues right when it matters most. Rosenberg: Water problem ‘self evident,’ but will state officials act? In many parts of Iowa last summer, the state’s poor water quality was plainly evident. Algae blooms, helped along by high water temperatures and low water levels, clogged many waterways. Ralph Rosenberg is the executive director of the Iowa Environmental Council. These blooms are a sign that far more of the nutrients nitrogen and phosphorous are present in Iowa’s waters than should be there in a healthy ecosystem. 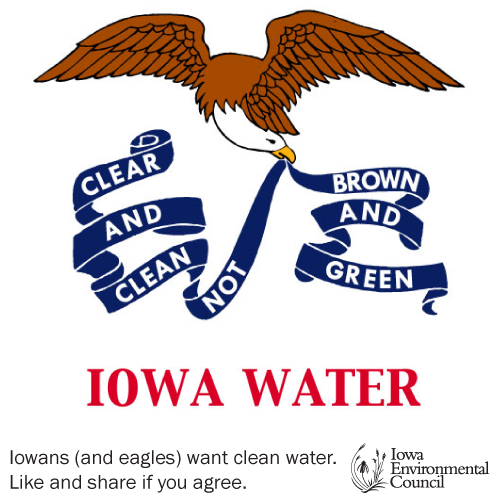 Combine this with chronic soil erosion which continues around the state, and you have Iowa’s polluted waters, which are more frequently brown and green than clear and clean. Nitrogen and phosphorous pollution comes from many sources, including agriculture, wastewater from cities and industries, and other sources. 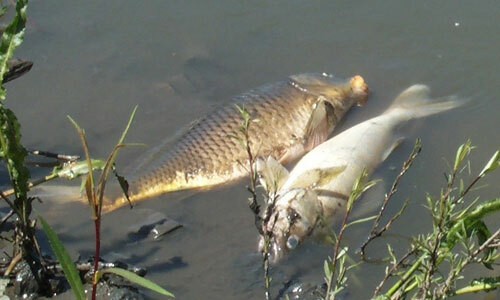 In Iowa, research shows that most of this pollution comes from agricultural sources. In November, with much fanfare, state government released Iowa’s nutrient reduction strategy, a plan that state officials say will help resolve this pollution problem. Developed over two years, the strategy calls on cities to install — and their residents to pay for — mandatory new wastewater treatment practices that will provide some benefits. It also includes an important new Iowa State University science assessment that can guide improvements on, around and downstream from Iowa’s farm fields. Unfortunately, though, as the plan is currently written, the strategy is not likely to achieve Iowans’ goals for cleaner water. 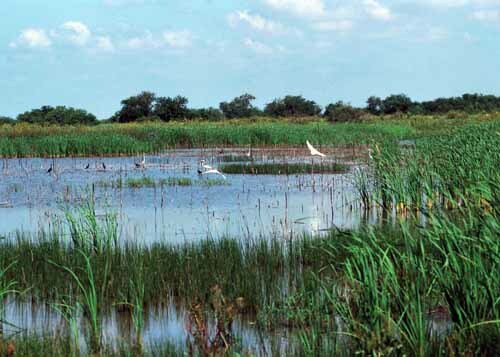 First, unlike the approach used for cities, the strategy continues to rely on all-voluntary farm conservation programs, which have fallen short of protecting our waters in the past. Even though research clearly shows significantly increasing farmer participation in conservation programs is critical for success of the plan, the document does not set timetables or goals to ensure that this will happen. Iowa does have a group of outstanding conservation-minded farmers who are achieving important results. However, Iowa’s “new” strategy continues to depend on these farmers to step forward even if their neighbors do not. Although the strategy sets a price tag for proposed conservation efforts with initial costs as high as $1.2 billion to $4 billion, it does not explain where this money will come from or when. Second, the strategy fails to list either short-term or long-term goals for water quality improvements for Iowa’s rivers and lakes. Without setting clear goals for clean water in Iowa at the outset, it will be difficult for Iowans to assess whether the strategy has been successful. Third, while the strategy contains important research on farmland conservation practices by an Iowa State University-led team, additional work is needed to explain how this research will be put to good use. The Iowa State team examined how successful currently available conservation practices are at reducing water pollution. Their research suggested combinations of actions by Iowa farmers that could achieve the goals of the strategy, if implemented broadly across the state. The science team states these combinations are suggestions, not policy recommendations, and the policy portion of the document does not propose a combination of practices Iowa should implement, or set goals or timelines for doing so. Further, the strategy made efforts to quantify the costs of implementing various practices, but it did not attempt to estimate the economic and quality of life benefits Iowans would enjoy if we achieve our clean water goals. For Iowans who choose to travel out of state to fish or canoe in cleaner water, Iowa’s pollution problem is self-evident. For Iowans who grew up swimming in the Raccoon River and no longer feel safe letting their children swim there, the problem is self-evident. For those living in municipalities that have to construct multi-million-dollar water treatment facilities, the problem is self-evident. These Iowans want to join together with others to solve this problem, but unfortunately, the strategy was written mostly behind closed doors with minimal public input. Now, after the release of this strategy, the public should challenge state government leaders to explain how they will establish accountability and measure success. 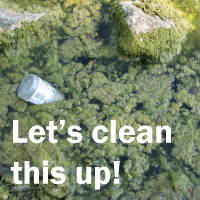 Iowans want clear, measurable results for actually achieving clean water. Fortunately, the science has never been clearer on how Iowa can achieve this result. The question now is whether our leaders will commit to making sure the job gets done. This essay also appeared in the Des Moines Register on January 6, 2012.